We have liftoff! Today marks the arrival of Robinson: The Journey on PlayStation VR, and after a lot of hard work for an amazing new platform, we’re very excited to be able to share the launch trailer with you. 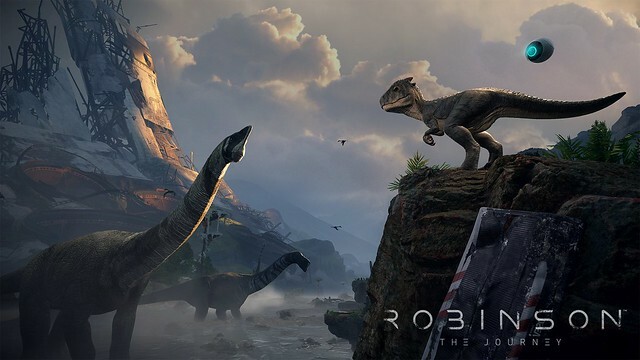 We first announced Robinson back in June 2015, and since then we’ve been obsessed with delivering on our promise of a game that offered an “unparalleled sense of presence” in a virtual world. Our inspiration for Robinson grew from themes that captured our imaginations as kids: science fiction, fantastical journeys, and, of course, dinosaurs. Stepping into the shoes of Robin — a young boy who is stranded on the mysterious planet of Tyson III — you’ll discover how PS VR has the power to bring all those elements to life in an entirely new way. In your quest to discover the fate of your missing crewmates, you’ll come face to face with fantastical creatures, collaborate with two starkly contrasting allies, and uncover a world bursting with detail and lore. Like all good journeys, Robinson also packs an emotional punch — placing you at the center of a story that will draw you deeper into the game world and — we hope — live long in your memory. It’s always a special moment for developers to reach launch day. Partly because the hard work is done, but mainly because it’s the day we get to share the game with the people we’ve been making it for all along. The journey starts here.